Last Saturday, myself and Moose Peterson were teaching a workshop (for Unique Photo) in Paterson, New Jersey. The good people at Unique Photo picked the location for us, so we had no idea what to expect when we arrived. We had heard that the town was not the greatest or safest place, but that they had a waterfall right in the middle of town. So...we headed out from our hotels in NYC and headed for the location. As we arrived, the first thing we saw was this amazing tree full of fall colors. As Moose said, this tree just called out "shoot photos of me" and so we did. As Moose taught the students, I went around and shot images of this tree and thought that it would make an interesting blog entry and lesson. The thought was...How can you use just one tree and make many interesting images? I took this photo to show the entire tree. This is the "standard shot" that most people would take. It is nice, but we can do more with this. I replaced my wide lens with my 70-200 zoom lens and keyed in on one section of the tree that interested me. A totally different look from the wide shot. Some more detail shots of the tree branches and colorful leaves. A good photographer is always aware of their surroundings. I always teach people to not only look in front of them, but all around, up and down. In this case, I looked down by one of the tree roots and saw this nice cluster of leaves resting against the root. When looking around the area, I also came across these steps. I loved the way that the leaves were evening scattered across the concrete. You will notice that there is a slightly red tint to the concrete. This was caused by the sunlight hitting the red brick walls just off to the right of the image. I walked down towards the waterfall, turned back and saw the same tree in the background of this statue. I did shoot some tight shots of the statue and tree, but liked this image, which uses the staircase as an added element to the photo. And, since we were at the waterfall, I thought that I would include a couple of images of this, so that you could see where we were. This last shot was taken from the sidewalk, as we made our way towards the bridge over the waterfall. I stopped the group and had everyone shoot from this location since it has the classic foreground (trees), middle ground (building and bridge) and background (falls) elements to make a nice shot. I will do another blog soon, showing the photos that we took of the models during the workshop. Fast memory cards and card readers - Do you really need them? Want to know more about how your camera, computer and memory cards work - and work together? Or how to make sure you're not underbuying or overbuying equipment? Then this post is for you. Being a professional photographer and also being affiliated with Lexar, I have a unique understanding of both the needs of a photographer and the technology that's out there to address those needs. I hope I can help explain the elements of digital workflow (cameras, computers, memory cards and card readers) to help you purchase the right products, and maybe even save you some time and money in the process. I have been a photographers for many years and have photographed a wide range of subjects - The Olympic Games, landscapes, Bar Mitzvahs, Senior Portraits, and countless others. Each type of photography is very different and presents different needs in equipment. 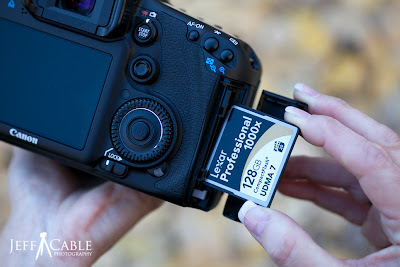 One of the most common questions I get is, "Do I need a high speed memory card?" Before I answer this question, I want to explain that there are actually two speeds that you should be aware of. There is the card's write speed, and there is the card's read speed. The write speed determines how quickly your camera can move the digital photos from it's buffer to the card, whereas the read speed determines how quickly those photos can be copied from the card to your computer's hard drive. Lets first answer the question in reference to the write speed. My answer to this question is usually another question, "Are you filling the buffer of your camera?" When I shoot sports, there are many times when I fill the buffer of my camera and need the camera to flush the images as quickly as possible to the memory card. For this, I want to have the memory card with the fastest write speed possible. But if I am shooting senior portraits, I'm not hammering on the shutter release, and almost never fill the buffer in my camera. Do I need a 1000x CompactFlash (CF) card for this? Nope. I rarely shoot video with my DSLR cameras, but if you do, this is another good reason to get a fast memory card. Since the camera is pouring so much data to the card, video requires a fast card that can handle at least 90MB per second. If you try to shoot video with a slow memory card, chances are that the video will either stop during the recording or you will lose frames in the process. If you are using an older digital camera, and you purchase the fastest memory cards, you may be wasting your money. The newer CF cards use a technology called UDMA to achieve really fast transfer speeds, while SD cards use a technology called UHS, but if your camera is more than 5 years old, chances are it doesn't support either of those technologies and can clear your buffer no faster than 133x. Yep, that means that even though you bought a really fast card, your camera defaults to a much slower write speed. Now let's answer the same question in reference to the read speed. For this, I ask "How fast do you need to download to your computer?" Even if you have an older camera that can't write to the card quickly, it may be that you still need to download quickly, in which case a faster card will still be beneficial to you. If you're a regular blog reader, you know that at the Olympics, I was under major pressure to download, select, retouch, resize and post within two hours of every event. For this, I needed to have the fastest cards and fastest card readers possible. (We'll talk about card readers in a little bit.) Inversely, if I have just photographed my wife's birthday party, download speed may not be as critical, and a slower, less expensive memory card would be sufficient. So at this point, you might be thinking that shooting sports is the only time that I need high speed memory cards and readers, right? Nope - not the case. I shoot events like Bar Mitzvahs and weddings here in the San Francisco Bay Area, and do my best to be unique. I like to photograph the service and then provide a slideshow of the best images, sometimes within minutes of the event. At these times, having memory cards with a fast read speed is very important. This gives me the ability to download, select the best images and build the slideshow, and then get right back to shooting more images - without missing a beat. Time have changed, and with the newer cameras shooting at high megapixels, I find myself burning through gigabytes at an alarming rate. A typical day of event shooting will yield me more than 40GB of images. 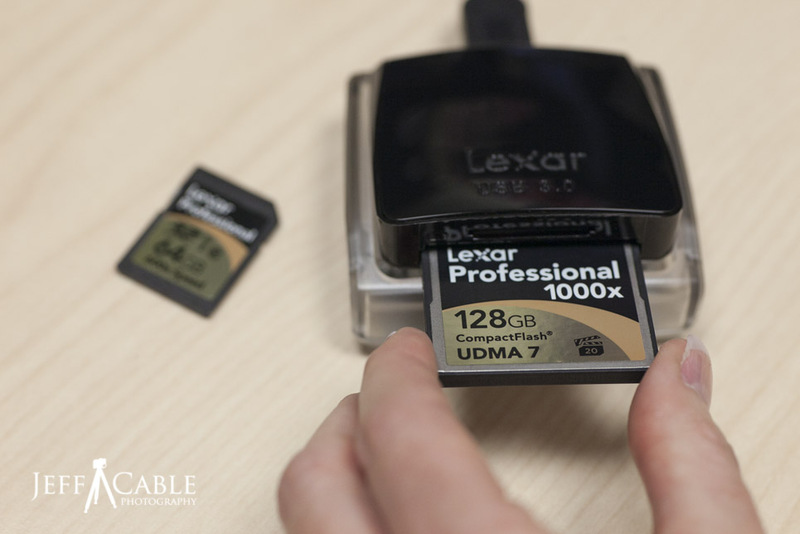 A memory card with a fast read speed can help me offload those images in minutes instead of hours. This brings me to card readers. Before working at Lexar, I would head down to the local store, find the least expensive reader and make m y purchase. I was the guy who thought that all card readers were the same. I remember, many years ago, walking through the hallways at Lexar and hearing about the development of a high-speed reader, and I thought, "Huh? I thought a reader was a reader." Nothing could be farther fro the truth. The fact is, just like memory cards, readers come in different speeds. And it is important to make sure that you use the right reader for your computer. If you are using a newer computer that has a USB 3.0 port, you should purchase a USB 3.0 card reader, which will provide you the fastest possible transfer rate. I always carry USB 3.0 readers with me for two reasons. First of all, as I mentioned, they are wicked fast, and secondly, I love the fact that they can be used on almost any computer since they are backward compatible to USB 2.0 ports. Even better, they are not very expensive. People ask me if the brand really matters. I can honestly tell you that it does. I am not going to be biased here, and I will tell you that there are some very good brands in the market. But there are also some brands of memory cards which use low quality memory and inexpensive parts. These might be fine for the typical consumer, but if you are serious about your photography, you should stick to the name brands. For those of you who are feeling really geeky right now and want to dive into the technical aspects of memory cards and readers, this section is for you. There are really three key components of a memory card. First there is the flash memory where all of the images are stored. There are numerous types of memory used in cards, with the most common being MLC (multilayered chips) and the more expensive and faster cards using SLC (single layer chips). Secondly, there is the controller chip which is essentially the brain of the card. Just like the memory chips, there are different speed controllers, which, when married with high speed memory chips, ultimately determine the speed of the card. I like to tell people that the card's controller is equivalent to the card's brain. Lastly, there is the firmware. This is basically the software that resides inside the controller, giving the instructions on how data should be moved. To give you an example of how a card communicates with a camera, think of a foreigner communicating with you using a translator, who then needs to decipher your information and communicate it back out to the other person. The faster the translator, the faster your communication. The controller is a lot like the translator. It takes the image data from the camera, determines how it should be stored on the memory chips, puts it in the right place, and does so at it's fastest speed. Did you know that card readers also have controllers and firmware in them? And just like in the memory cards, these determine the speed of data transfer between your card, your reader and your computer. This means that if you want to get the fastest data transfer possible, you need to have a fast card and a fast reader. If you have a memory card capable of transferring 150MB per second, and insert it into a slow reader, it is quite possible that you will only be moving the data at 9MB per second. Scary, but true! Now, the next time you walk into a store and see all the different memory card and card reader options in front of you, hopefully you will be able to make a more informed decision when making your purchase. At the very least, maybe you will have a little more appreciation for these little pieces of metal and plastic.